Platinum (usually with the admixtures of iron - iridium, osmium, palladium). Glance (glitter, glare) metallic, opaque. Colors silvery-white. Fracture, break hooked, forging. Cleavage non-existent. Appears in ultrabasic rocks. Accumulates in mineral deposits. 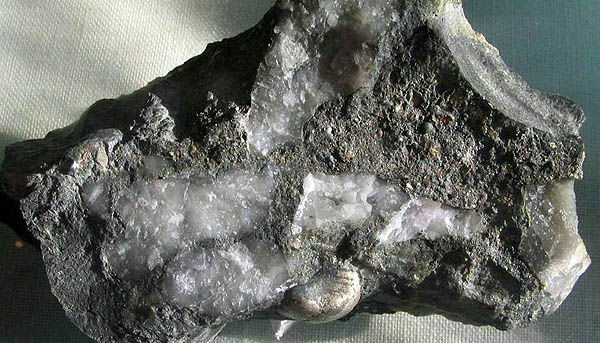 The important ore mineral of platinum is sperrylite PtAs2. Crystals (cube Crystal structure) are rare; usually platinum is presented balled material grains or tuber-like, tuberiform nuggets. Used mainly for laboratory tableware, in electronics, electrical engineering. Deposit minefield mine field occurrence subsoil: South Africa, Canada, Ural, Alaska. Native platinum rarely is chemically clean, contains iron (to 18%), copper, gold and other elements. Well well-educated crystals are very rare. 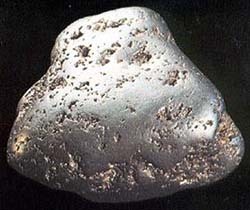 Usually there are shallow grains, scales and nuggets (an exceptional case is a platinum nugget weighing 9 kg). 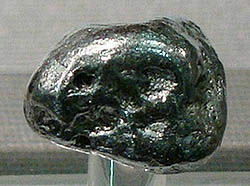 Native platinum in was the beginning taken for a variety by silvers. Platinum for jeweller business a metal is not nearly new. A rumour in platinum decorations was known yet by ancient Egyptians: in excavations of tombs archaeologists found the most elegant platinum decorations. Platinum (British Platinum, French Platine, German Platin), probably, was known as early as antiquity. A ductile malleable silvery-white metallic element, very resistant to heat and chemicals. It occurs free and in association with other platinum metals, esp in osmiridium: used in jewellery, laboratory apparatus, electrical contacts, dentistry, electroplating, and as a catalyst. Symbol: Pt; atomic no. : 78; atomic wt. : 195.08; valency: 1-4; relative density: 21.45; melting pt. : 1769oC; boiling pt. : 3827±100oC. Chemical composition (chemistry, compound). Platinum (Pt) 79-96%, iron (Fe) 4-21% (platinum and iron can isomorphous substitute for each other), iridium (iridium platinum) to 7%, palladium (palladic platinum) 0,1-1% (rarely to 7%), rhodium (rhodium platinum) 0,1-0,5% (rarely to 5%), sometimes there is a nickel in substantial amounts (nickeliferous platinum). Form of crystals. Hexahedral crystals. Crystalline structure. Granecentrirovannyy cube (sm of tablas. 1). Poliksen very looks like native silver and native iron. From silver differs more high hardness and closeness. Aggregates. Leaves, grains, cloddy, lump-like nuggets. Not added influence of not a single acid, except for "aqua regis (chloroazotic acid)" (mixture of nitric and hydrochloric acid), in the last can dissolve at heating. A behavior is in acids. Dissolves only in aqua regis (chloroazotic acid, chloronitric acid, nitrohydrochloric nitromuriatic acid), I.e. in mixture, consisting of one part of concentrated HNO3 and 4-6 parts of concentrated HCl. Appears in the process of segregation during the cooling-down of basic and ultrabasic rocks, enriched olivine. Often concentrated at weathering, as possesses high specific gravity, that allows it to accumulate in alluvial placer mineral deposits mines. The most essential deposits were opened in 1822 on Ural (not far from Perm). Other considerable deposits - in Borneo, Ethiopia, Republic of South Africa, Canada, Colombia and Australia. Platinum is used on jeweller business and in scientific researches (strong catalyst). Used also on jeweller business for the production of expensive jeweller decorations. 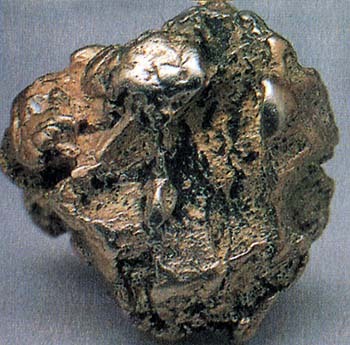 Gold-Platinum conglomerate with Pyrite pebbles shingle. Vitvatersrand, Africa. A photo: © A.A. Evseev.